In 1979, South African Allan M. Cormack won the Nobel Prize in Physiology or Medicine for his development of X-ray computed assisted tomography (CT), which allows physicians to see internal bodily structures without cutting. A quarter of a century later, Sir Peter Mansfield of the United Kingdom was given the same award in 2003 for advances in magnetic resonance imaging (MRI) that led to scans taking seconds rather than hours. Today, these two imaging techniques serve as essential diagnostic and investigative tools for both medicine and the life sciences. But one unique fact about Cormack and Mansfield stands out: Despite winning the most prestigious award in medicine, neither Laureate went to medical school nor had a background in biology — rather, they were both true-blue physicists. Cormack spent most of his research career focusing on nuclear and particle physics, while his CT efforts remained an intermittent side project for almost two decades. For Mansfield, his postdoctoral work on nuclear magnetic resonance spectroscopy in doped metals gradually transitioned into scanning his first live human subject with the newly invented MRI technique. 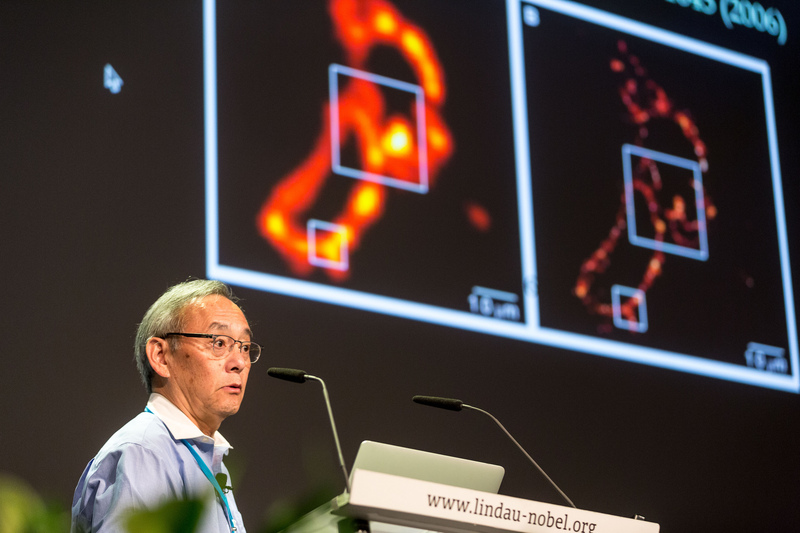 The tradition of physicists driving advances in biomedical imaging continues, as made evident by the lectures of Steven Chu and Stefan Hell at the 66th Lindau Nobel Laureate Meeting. Both showed visually stunning examples of their research using super-resolution microscopy, a method that transcends the diffraction limit of conventional light microscopes to probe on a nanoscopic scale. Hell, a physicist who currently serves as a director of the Max Planck Institute for Biophysical Chemistry in Germany, accomplished what was long thought to be the impossible. Using light microscopy and fluorescent labeling of molecules, he invented a super-resolution technique called stimulated emission depletion (STED) microscopy — the work that won him the 2014 Nobel Prize in Chemistry. A conventional microscope cannot distinguish objects — say, molecules — that are packed within a space of about 200 nanometers because they all become flooded with light at the same time. Subsequently, a detector will simply record the scattering as a blurry blob of light without being able to image any individual molecules. Hell got the idea of highlighting one molecule at a time by using fluorescent labeling, while also keeping other molecules in a dark state through stimulated emission. With a phase modulator, he could then force molecules in a doughnut-shaped area to stay dark and in the ground state while those in the center would produce light. With this discovery, biomedical researchers could now image objects as tiny as proteins on the outside of a virus. For instance, STED microscopy was used to observe a major difference in envelope protein distribution that can be used to distinguish mature HIV that can infect cells versus those immature viruses that cannot. Steven Chu referenced Hell’s groundbreaking research during his lecture on Wednesday morning, which focused on his recent efforts in optical microscopy — quite a departure from his previous work in energy during a decade-long sabbatical. A venerable jack-of-all-trades, Chu received the 1997 Nobel Prize in Physics in yet another field — atomic physics — for his development of laser cooling and trapping techniques. His latest interest in microscopy grew out of a fascination with cell signaling and how dysfunctions in the process can lead to cancer. Using imaging techniques, the cell signaling pathway can be investigated in detail to target areas that could prevent cancer from developing. Taking Hell’s work in super-resolution microscopy a step further, Chu discussed his use of rare earths embedded in nanocrystals to replace fluorescent organic dyes. A nanocrystal can be doped with 5,000 to 10,000 impurities so it emits a certain color in the near-infrared with a very narrow spectral peak. If each class of nanoparticle is synthesized to produce a different ratio of colors, this creates a spectral barcoding of probes. The next step is to use nanoparticle probes to image molecules through tissue in a living organism without cutting. Adaptive optics — a technique that originated in astronomy — has been employed in order to take light scattering into account, enabling high-resolution microscopy of mouse brain tissue through an intact skull. One of his ideas involves inserting nanoparticles into cancer cells and watch them over time in order to track which cells metastasize, with the ultimate goal of developing future therapies.